Manageability is a result most of us look for (or at least hope for, in my case) in hair care products. 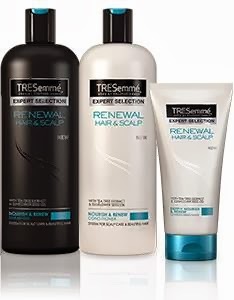 TRESemme’s Renewal Hair & Scalp Shampoo, Conditioner and Conditioner Mask with tea tree and sunflower oil, promises just that. Using all three products helps repair your hair from damage from hair coloring, pollutants and stresses to deeply nourish the scalp with moisture and hair with nutrients. All three products have the subtle feminine scent you would expect from a TRESemme product, almost a sweet floral, I would say. Personally, the scent is what makes me happy about using any TRESemme product. After all, who doesn't love smelling pretty? I have long thick hair, and I am no stranger to frizz, so I’m always stoked to try out a product that says it will help manage it. The first time I used all three of these products I noticed that my hair was much softer and well moisturized. Unfortunately, it did very little for my frizz issue. The second time I used all three products I opted not to use a hair dryer to style my hair, this helped a little more with managing the frizz. Overall, I would recommend this product to those who would like to help repair their hair if you color it often, as well as those who would like a hair product that helps nourish and add shine to their hair while getting it squeaky clean and smelling pretty. All three products retail for around $5.99 each. You can find out more about the new TRESemme Renewal Hair and Scalp System as well as other TRESemme products at www.tresemme.ca. Disclosure: All opinions are my own. I received TRESemme Renewal Hair & Scalp System at no cost for the purpose of this review. No other compensation was received.